Cymbals clashed, bells pealed, drums thumped – a wild cacophony of sound erupted from the sanctum, accompanying the swaying devotees chanting feverishly all around me. Dikshitars, Brahmin servants of the Lord Shiva, wandered through the crowd holding a flame, allowing the worshippers to inhale the smoke before falling to their knees in reverence. Just as it sounded as if the crashing and banging of instruments couldn’t be any more out of sync, they reached a crescendo and inexplicably fell into unison as the doors to the inner sanctum were drawn open to reveal a bejewelled statue of Nataraja (Shiva, the Lord of Dance). I was standing in the central chamber of Chidambaram’s Sabhanayaka Temple during one of the day’s fire ceremonies, feeling both completely out of place and strangely drawn into the fever of the moment. 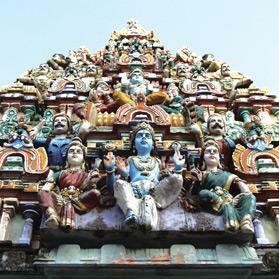 Chidambaram is a small city in Tamil Nadu, wholly unremarkable except for its temple complex. It took a nine-hour, non-stop journey on a local bus to reach the place – a trip I can safely say I won’t make again, but was entirely worth the pain. It is one of the only temples where non-Hindus are allowed to participate in the daily ceremonies and view the inner sanctum. Tamil Nadu is India’s southernmost state and the setting to my education in the real India. It’s easy to be drawn to the beaches and bars of Goa and Kerala when in south India, but for a taste of the traditional culture you need to take a side-step to Tamil Nadu, home to a number of temple towns. Madurai is as good a place as any to start your tour of the famous temples of Tamil Nadu. Like many other bustling Indian cities, crossing the road is a matter of timing a mad dash between scooters, tuk-tuksand cows, but one way or another you will manage to make your way to the Meenakshi Amman Temple. This ancient temple is the very heart of Madurai and draws in tens of thousands of visitors on a daily basis, with good reason. Certain chambers are off limits to non-Hindus but the open areas will keep you entranced for the better part of a day. As the third-largest city in Tamil Nadu, Madurai is the best place to base yourself before setting out to visit other temple towns. One such town is Tiruchirappalli, otherwise called Trichy for obvious reasons, which is a pleasant three-hour bus ride from Madurai. Trichy is known for its Rockfort Temple, which sits atop an 88-metre-tall rock with a brilliant view of the city, its river and other temples in the distance. The only downside is the 423 steps you have to conquer to reach the top. You’ll have earned your thali, which you can pick up cheaply in any of the small restaurants in the marketplace that sits at the bottom of the hill. Eating a thali for the first time is a lesson in itself. Simply translated as a ‘meal’, it is the cheapest and tastiest lunch or dinner option on the menu. How and what is served depends on the establishment and region. In Tamil Nadu you can expect a banana leaf to be placed in front of you upon ordering, and then a server to come around and spoon a mound of rice onto it. Next you’ll be served four or five different sauces and lentil dishes (dal). There are plenty of other temples to visit in Trichy and after your lunch stop you may want to move on to the Sri Ranganathaswamy temple, dedicated to Lord Vishnu. It boasts a 72-metre tower and is often referred to as the largest functioning Hindu temple in the world. From mesmerising ceremonies to incredible architecture, beautiful paintings and fascinating mythology – the temples of Tamil Nadu have a lot to offer. While the intricacies of the inner workings of these sacred sites are likely to remain a mystery to their foreign visitors, even a short trip willbe enough to serve as an insight into the underlying reverence of their devotees.